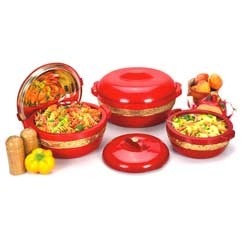 We are a preeminent organization that is engaged in manufacturing, supplying and exporting a broad spectrum of Hot Pot Set. The range offered by us is manufactured employing latest machines and equipment following industry norms & standards. Post-manufacturing, our range is stringently inspected by our quality controllers on certain parameters in order to rule out every possibility of defect. Furthermore, we customize these as per customers' requirements. Keeping pace with variegated requirements of customers we manufacture, supply and export optimum grade Steel Hot Pot Set. These products are manufactured at our state-of-the-art infrastructure facility using food grade material. Before final dispatch, these sets are thoroughly inspected on certain parameters of quality. We are instrumental in manufacturing, supplying and exporting a high quality range of Stainless Steel Hot Pot Set. Our offered product-line is manufactured employing latest machines and advanced technology following industry set guidelines. Moreover, we make sure that these sets are timely delivered at clients' destination using easy modes of shipment. Capacity: 800, 1500 and 2500 ml. 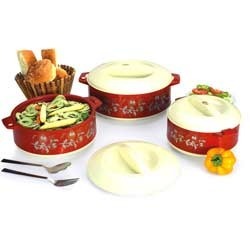 We are dedicatedly engaged in manufacturing, supplying and exporting high quality 4 Hot Pot Set. Our products are manufactured under the close supervision of skilled professionals employing latest machines and high grade material. All these hot pots are made available by us in various capacities, designs and colors at industry leading prices. Capacity: 500, 1000, 2000, 3000 ml. 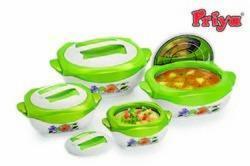 We are a renowned organization; which is engaged in manufacturing, supplying and exporting a vast array of Hot Pot Set. The offered products are manufactured using high quality food grade material that is sourced from reliable vendors of the market. These products are offered by us in various specifications. We are counted among the leading manufacturers, suppliers and exporters of a wide array of Hot Pot Set. The offered hot pots are designed and manufactured using high grade material that is sourced from trustworthy and reliable vendors of the market. To rule out every possibility of defect, our quality controllers inspect these on certain well-defined parameters. Capacity: 500, 800 and 1500 ml. We are a preeminent manufacturer, supplier and exporter of excellent quality Hot Pot Set. 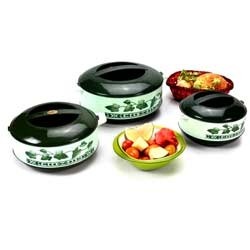 To manufacture these hot pot sets, our experts make use of excellent quality food grade plastic that is sourced from vendors of high repute. In addition to this, we customize these products as per the requirements detailed by customers. Capacity: 500, 800, 1200 and 2500 ml. Leveraging on our enormous industry experience, we are engaged in manufacturing, supplying and exporting a vast array of Hot Pot Set. 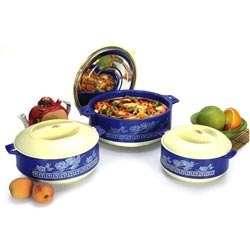 Manufactured using excellent quality food grade material, these hot pot sets keep the food warm and sumptuous. We offer these products in variegated sizes, designs and colors to cater to the diverse demands of customers. 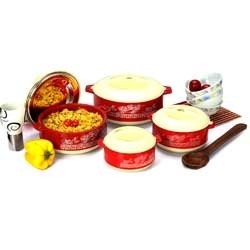 Ours is an illustrious organization that is involved in manufacturing, supplying and exporting high quality Hot Pot Set. Superior quality food grade material, which is sourced from most authentic vendors of the market is used in the manufacturing process. Customers can avail these sets in variegated colors. 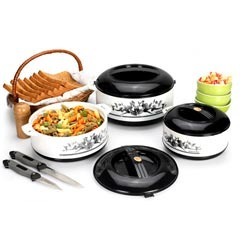 We are a coveted organization that manufactures, supplies and exports finest quality Hot Pot Set. All these sets are manufactured under the close supervision of our experienced professionals. To cater to the variegated requirements of our customers, we offer these products in various colors and sizes at nominal prices. We are a paramount organization, which is involved in manufacturing, supplying and exporting high quality Hot Pot Set. 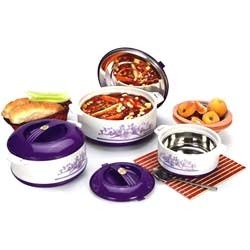 These hot pot sets are manufactured using optimum-grade material following industry standards & norms. Post-production, these hot pot sets are inspected on certain parameters of quality in order to rule out every possibility of defect. With firm commitment to quality, we are manufacturing, supplying and exporting a comprehensive range of Hot Pot Sets. All these products are made in accordance with the established norms and guidelines of the industry. Our quality experts examine these products on varied parameters of quality and health, before the final delivery. In order to fulfill the requirement of the customers, we also offer custom-built range of the entire product-line. We manufacture, supply and export a spectacular array of Hot Pot Set. 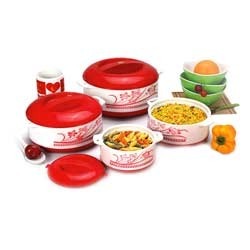 The excellent quality food grade plastic used to manufacture these sets is procured from certified vendors of the market. To meet the diverse requirements of our esteemed customers; we offer these sets in various colors, designs and capacities at nominal rates. 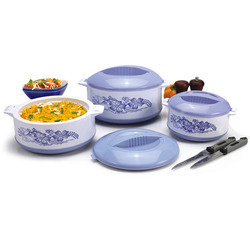 Fluidic casserole set of 4 pcs. is a hot selling item of priyaplast. We have deigned this item keeping in mind the customers preference of a different shape. Its stylish curves are very attractive and it has clicked in all the markets that have tried it. This one of a kind product has wide acceptance and feedbacks have been tremendous in terms of volumes and margins.